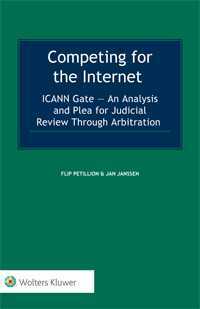 Competing for the Internet is the first detailed study of complaints related to Internet Corporation for Assigned Names and Numbers’ (ICANN) decisions that have been brought using ICANN’s Independent Review Process (IRP). The ICANN, founded in 1998, is a not-for-profit public-benefit corporation established to ensure a stable and secure global Internet. As the custodian of the Domain Name System (DNS), one of its key responsibilities is the introduction and promotion of competition in Internet-related markets, an aim which ICANN has tried to achieve through the delegation of generic top-level domains (gTLDs). This book investigates how successful ICANN has been in achieving this goal. Over the years, ICANN has been required to decide on a substantial number of complaints from applicants for gTLDs related to capture, arbitrariness, discrimination, and unwarranted restriction of competition. The authors – preeminent expert practitioners in international litigation and arbitration related to Internet governance – take a close look at how ICANN has handled the major issues raised and how ICANN has shaped its own accountability mechanisms. The book also weighs the influence of external accountability on ICANN’s decision-making process and considers the implications of third-party decisions (such as IRP decisions) for the ongoing development of the Internet. the 2016 amendments to ICANN’s articles of incorporation and bylaws, concentrating on the problems that remain unresolved. This work is a welcome addition to the debate on how to address the shortcomings in ICANN’s accountability in the interests of the global Internet community. The authors’ concrete proposals and recommendations, suggesting changes to ICANN’s regulatory framework in the light of the lessons learned and with a view to preventing similar problems arising in the next round of gTLD applications, help practitioners learn to address such problems in the amended regulatory framework. This book has the potential to become the Green Book for fundamental changes to ICANN’s accountability framework.